Model size: 13.75" x 10.25"
Available only through PatternsOnLine.com . Description: The splendor of harvest time is captured in this sampler stitched in shades of cream, peach, gold, olive and antique violet. 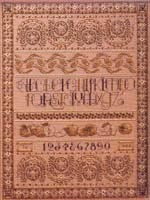 Specialty stitches are combined with cross stitch to create several different motifs including wheat stalks, apples, and a novelty alphabet. A border accented with more specialty stitches and beads finishes the sampler. Background Information: The inspiration for this piece came from a photograph of a piece of golden antique ribbon, and the motif that appears at the top and bottom of the sampler was born. After that, designing went quite quickly as I filled the sampler with other colors and reminders of the season. The original model was stitched using some rayon fibers, and pearl cottons for contrast. Stitching Comments: This is a fun piece to stitch if you enjoy trying different specialty stitches (a dozen of them!) It is not too large, either, and moves along fairly quickly, and the chart is very clear. You definitely won't get bored with this design! Specialty Stitches: Algerian eyelet, upright cross, diamond eyelet, Smyrna cross, straight and diagonal satin, herringbone, three-sided, barrier, long-armed cross, knitting, lazy-daisy.